Seagull S6 is a sub-brand of Godin’s guitars. In 1982, Robert Godin introduced the Seagull guitars. These guitars were handmade in Canada. We can see how North America crafted the pieces together with its natural resources found in their region. The Seagull S6 started to pave its way in the 1990’s. By this time, very few manufacturers offer an affordable solid top acoustics. But, the Seagull S6 was already doing its competitive marketing strategy with its low price. And for over three decades, these handmade guitars are staying competitively against its opponents’ brands. If you are a beginner, you might have come across with this in the search of your first guitar. Surveys would tell you that it is one of the top guitars for beginners. Is this really true? Others may say yes but if you ask an acoustic professional player they may not agree with this. Some longtime players have already tried this guitar and they say that is amazingly performing well on the level of its price range compared to other acoustic guitars in the market. Some even rate this as an intermediate kind of acoustic guitar. Why do they have such an opinion? Let us look thoroughly to the piece being talked about and decide if what kind of guitar is it. We may even discover if this guitar is the one we are looking for all this time. The Seagull S6 has a typical look of a guitar. It is very traditional. There is no unusual or difference from any ordinary guitar at first glance. No cutaways to see if there is something inside or if there are any special parts on the body. No catchy features or inlays outside its body. Just very normal. The body has a dreadnought shape which is very standard. In the guitar industry, the composition and the materials used in each part determines the tone of the guitar. So the guitar’s face is an important factor to set a standard. The Seagull S6 guitar is made of a pressure-tested solid cedar top. Solid top is very important because you can just find it on expensive or high-end guitars. It is because when you say solid, you are getting the real wood itself not of thin layers of good wood that only covers the top of the inexpensive wood that manufacturers do to cut the cost of the production. Another thing why it is important because as the cedar wood ages it gives of more resonance like a good diaphragm action in giving out sounds. Another thing is that this solid cedar top is pressure tested. Pressure tested means that the company really test each piece for strength and hardness to handle a great deal of vibrations. With its body, it gives off sound which is loud and clear. Its resonance makes the playing very easy and less effort. 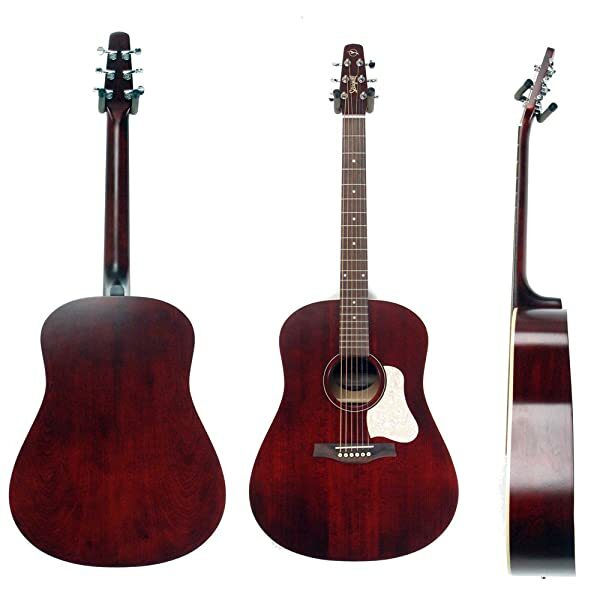 The cedar top does great for fingerpicking and it also sounds better for strumming. Cedar wood also offers a warm tone and the sound sometimes hides the inconsistency of a player into a minimal aspect. So the Seagull S6 is tonally satisfying. The back and the sides of the Seagull S6 is not a cedar wood. It is made of a different variety which is the Canadian Wild Cherry. The new versions are now quite stained. A little bit darker from the older releases. It is finished with a semi-gloss lacquer. The gloss coating was really adopted by the Seagull from other manufacturers to hide the imperfections of the wood or the grainy texture and design of the wood surface. Though the gloss made the piece an elegant craft, the gloss can be the cause of stickiness when the sweat for the player glides on the surface. And the sticky feeling brings a kind of uneasiness or distraction on the part of the player. It goes well with its cedar top. As arranged together, the body shows off its durability, though it seems to be a bit bigger. Compared with the body of the guitars on the same level of affordability, the Seagull S6 is well-refined and made with very minimal seen defects, not even noticed at all. The Seagull S6 neck also comes with some great features. It is attached at the body on the 14th fret. The neck is made of silver leaf maple. Some say it has a robust neck compared to others. The reason is that is it’s a bit thick. Of course, if you have big palms and longer fingers, it will not be very hard for you. You would say it does fit your hands perfectly. Unlike with average and smaller hands, they will say that it doesn’t wrap around the neck compared to other acoustics guitars. But we all know that with certain practice and devotion, everything will be solved. You will just get used to it in no time. The fingerboard is topped with rosewood. It has a smooth but not too shiny finish which is very comfortable with your fingers. The fretboard has 21 frets with a 406mm radius that makes it easier to transfer between the octaves. Well, this fretboard seems to be the standard of any guitar. Since acoustic guitars depend on themselves to produce the sounds, it is very important for them to focus on how to make the tuning stable. And everything in the headstock has to do with it including the arrangement of the pieces in that part. The headstock of the Seagull guitar is a bit smaller if you will compare it to other acoustic guitars. This is because Seagull wants to put the tuner in lined with the nut to produce stability in tuning. So there is a tuning device that makes the tuner and nut aligned and keep the strings in a straight manner. It feels a little bit stiff but later on, you will appreciate the benefit of it. It will always keep the tuning in place. The width of the nut is 45mm and it has a wider string spacing. The Seagull guitar uses a compensated tusq and saddle — that was made the Graph Tech. It helps the tone of the guitar and to play it smoothly. This compensated tusq and saddle also do a special part when you change the strings. It grooves the different strings into different directions. This is a very rare feature because you can only find this in high-end guitars. As explained, the Seagull guitar has a loud and clear sound which is a great feature of the guitar. The sounds also sustain and lingers on for some moment so the notes and the tone are really audible and can be easily recognized. But the problem is that it does not have a lot of bass in it. This guitar will be loved by the players who like brighter tones because it is very good with high tones. Chords give off sounds like a chime of a bell. But on the other way round, the players who loved deeper and richer tones will surely not be satisfied. Though it also has tones for lower ranges, it will not still give you distinctive thicker tones if you are expecting to have one. The Seagull guitar has an acoustic version and an acoustic-electric version. In the acoustic-electric version, the body has a bass, volume and treble controls. It becomes as an onboard tuner also. Though we know that acoustics guitars should be played without any amplification but sometimes if you are in a crowded area with a lot of noise, you will really need the help of an amplifier. This is the reason why the acoustic-electric version is of great versatility. But the price also changes. A bit higher to add the cost of the electronics attached. As we said at the outset, this guitar runs its competitiveness in its pricing strategy. These guitars can be bought below $500. Compared to the material is used, your $500 will not be put into shame. We can say that the Seagull S6 gives us the quality that we can usually get in a much higher price range. The sound quality for the Seagull guitar will not show that it only cost below $500 but can be compared to the sounds produced by the other brands of acoustic guitars which are priced higher than it or twice as expensive as it. You are actually paying for craftsmanship and construction together with the high-quality woods used to the piece. We also said that there is nothing really different on this guitar on its physical appearance compared to other acoustic guitars but you can see a much quality when you start to play with it. It will let you feel how the piece was carefully made to satisfy the awaiting market enthusiasts who are looking for a quality guitar at a price that they can afford. Though the beginners will be glad to get this because of the price but long time players will much really appreciate the built and quality of this guitar. For an entry-level guitarist and those who are just starting, they may say that it is a bit pricey compared with the other low-cost brands. Don’t be deceive. The Seagull S6 is really a great catch on its price range because of the aforementioned quality and features. But for a beginner who wants to start with a quality guitar, they will agree that the Seagull S6 is what they need. For the pros, it has good built with a solid top that creates a very good tone. It also has a good sound quality — loud and clear with a very good resonance. Audio is really commendable for being good. It is very good for fingerpicking and strumming. Sounds lingers a bit longer. Excellent design of the headstock that keeps the strings stable to keep the tune. Easy to project. The fell is very good. Very easy to play with. Versatile because of the option to have it in acoustic or acoustic-electric version. Priced well considering the materials and construction it went through plus the quality. With cons, which are very few compared with the pros, it requires you to get accustomed to the sound especially if you are not a user of a guitar with a cedar top in the past. The 45mm nut is considerable to some but others will still prefer the 43mm. Still pricey to some people when they compared to other entry level guitars for beginners. Acoustic-electric version is more expensive. See more the best guitars of Seagull brand. A player who already owns one have also something to say. Of course, handling experience is very different with just an observation. The product reviewers of the Seagull S6 put a very good rating of 4.5-4.9 in terms of 5 as the highest. People who already owned one have the same basic comment of being satisfied because of its craftsmanship and quality. They pointed to the characteristics that this guitar has especially to the excellent audio, great feel, consistency and it does not easily get out of tune. Mainly, a lot of people are saying positively about the Seagull S6. It already proved itself on the market and to the people who are looking for a quality guitar at this price range. But before you buy it, consider the specifications and features. Go for it if you know it is the one you are looking for but don’t, if you are uncertain of your needs, for you don’t want to get disappointed. Overall, the Seagull S6 competes with the high end expensive acoustic guitars in terms of quality but not of price. It has an excellent value. Every cent that you will spend on this guitar is worth it. Rest assured that you will love it as it ages. And you will never tell how many times you’ll use this compared to the other guitars you have in your collection. Everything is guaranteed from its materials, craftsmanship, and sounds to its durability and versatility. I am a guitar player, teacher and composer. I started playing piano at the age of seven. Five years later I had my first guitar performance with a local band. My style was inspired by guitarists like Nuno Bettencourt, Joe Satriani, Jerry Cantrell, Marty Friedman, Zakk Wylde, Steve Vai and Dimebag Darrell. During my career I had many bands and music project, going through different styles of original music and sometimes cover bands. In 2012 co-founded the band Vulgar Bulgar (Pantera tribute band). In 2013 started teaching guitar at Rockschool.bg. Currently freelance guitar teacher, session musician and solo performing artist. Basic Left-Handed Guitar Lessons: Nothing is Hard to Learn, Lefties! How To Tie Nylon Strings On An Acoustic Guitar? Is It Strange? Why Basic Guitar Hurts Fingers and How to Conquer? Which is the Best Beginner Blues Guitar Book to Master Your Skill? 14 Best Guitar Riffs for Beginners Before Turning to the Next Level! https://bestbeginnerguitartoday.com is a participant in the Amazon Services LLC Associates Program, an affiliate advertising program designed to provide a means for sites to earn advertising fees by advertising and linking to amazon.com. Amazon, the Amazon logo, AmazonSupply, and the AmazonSupply logo are trademarks of Amazon.com, Inc. or its affiliates.